Today is Lawrence Ferlinghetti's 90th birthday. For those of you who haven't heard of him, he is an American poet and painter and the guy who in 1953 co-founded City Lights Bookstore in San Francisco. City Lights later went on to become the literary home of beat generation authors such as Kerouac, Ginsberg and Burroughs. Reading beat literature seems like a right of passage for most college students and my husband and I weren't any different possibly favouring Kerouac's work the most. A couple of years back we were making our way around California on a road trip and decided to visit the City Lights Bookstore and indulge ourselves in a little Beat nostalgia. 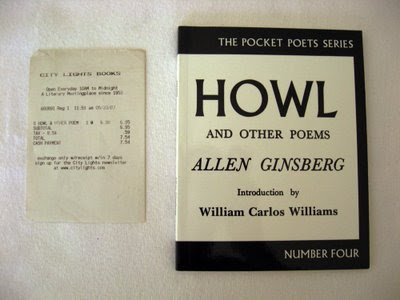 Allen Ginsberg's poem Howl has quite a history attached to City Lights which involved Lawrence Ferlinghetti getting arrested on charges of obscenity, read the full story here. We agreed it would be nice to purchase a copy of this book in particular from the store to keep as a little memento of our trip. 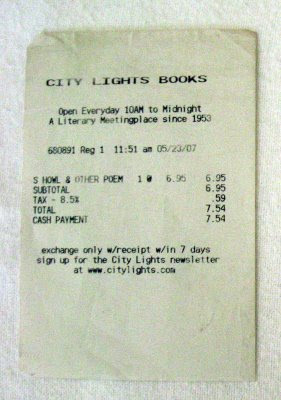 The photo above shows the receipt which I keep pressed flat in the first pages of the book to remind me of when and where we bought it. I also hope it will bring the book to life for someone who reads it in the future when myself and City Lights Bookstore may be long gone. Lawrence Ferlinghetti is on my list of people I would love to have over for dinner. It would be great to hear all his stories about the beats and the people of North Beach from that time. What it was like living in San Fransisco in the 50's and how life there has changed. On top of all this he has a great accent, I could quite happily sit and listen to him speak for hours. I do hope some of his conversations are being recorded for people to enjoy in the future. On a musical note, (this is after all a music blog!) when the beat generation was starting out, bebop was already well established as an innovative style of music. Musicians such as Charlie Parker and Dizzy Gillespie apparently made quite an impression on many of the beat writers who could often be found hanging out at Jazz clubs in New York. Some people argue that the genius of these jazz musicians provided the inspiration for Kerouac's 'On the Road' and Ginsberg's 'Howl'. Whatever happened, I'm glad it did and what a time it must have been to have lived in. Happy 90th birthday Lawrence Ferlinghetti! I love old paperbacks, and Dharma Bums is a classic. It's my fav Kerouac, I've read it more times than I can remember. 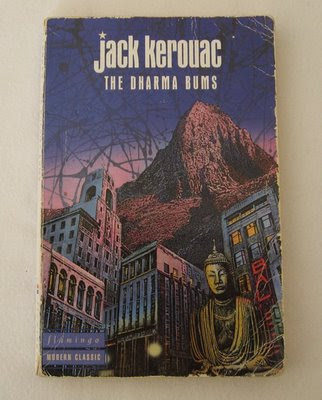 I saw a copy of the Dharma Bums once with a cover like that and haven't been able to find one since! What edition is it? Sorry for the slow response, it's A Flamingo Modern Classic 1994.